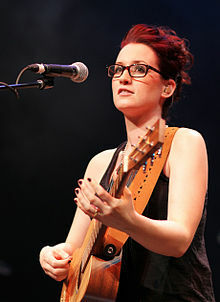 Ingrid Ellen Michaelson is an American singer-songwriter and actress. Her first album, Slow the Rain, was released in 2005, and she has since released six more albums, Girls and Boys, Be OK, Everybody, Human Again, Lights Out, and her most recent, It Doesn't Have to Make Sense. Her two highest-charting singles are "The Way I Am" and "Girls Chase Boys," at No. 37 and No. 52 on the Billboard Hot 100, respectively. Slow the Rain is the debut full-length studio album recorded by American pop singer Ingrid Michaelson. It was self-released on January 10, 2005. Girls and Boys is the second studio album from American pop singer Ingrid Michaelson. It was self-released on May 16, 2006. Some of the album's songs have been featured in the television series Grey's Anatomy. Michaelson's record label Cabin 24 Records re-released the album on September 18, 2007 and it peaked at No. 62 on the Billboard 200. Be OK is a compilation album by the musician Ingrid Michaelson. It was released on October 14, 2008. It entered the Billboard 200 chart at 35, with 15,000 copies sold in its first week. Michaelson is half Swedish,  and was born in 1979 in New York City,  to artistic parents. Her father, Carl Michaelson, was a manager of copyrights for the publishing company Carl Fischer Music and a composer on the side ("The Praise of Christmas"). Her mother, Elizabeth Egbert, was a sculptor, of Dutch ancestry. Michaelson took up piano at age four, and trained until seven at Manhattan's Third Street Music School, continuing for many more years at the Jewish Community Center of Staten Island's Dorothy Delson Kuhn Music Institute. While there she met vocal coach Elizabeth McCullough, who worked with her through high school. She is a graduate of Staten Island Technical High School and Binghamton University, where she received a degree in theater. While at Binghamton University she was a member of the Binghamtonics, a co-ed a cappella group, as well as the Pappy Parker Players, an improv comedy group, and the theatre repertory company under Sue Peters. Her time at Binghamton is mentioned in the song "The Hat." She grew up doing[ clarification needed ] a musical theater group called "Kids On Stage." Carl Fischer Music is a major sheet music publisher, based in New York City's East Village since 1872. The company has since moved to the Wall Street area in 2013. After 140 years, the company remains a family-owned business, publishing both performance and educational music for students, teachers, and virtuosos. Carl Fischer's composers and editors give clinics and sessions all over the country, and the company claims to serve more than 1400 retailers around the world. Staten Island Technical High School, commonly called Staten Island Tech or SITHS, was founded in 1988. Located in Staten Island, New York City, the school is operated by the New York City Department of Education. In 2005, Staten Island Tech became the only Specialized High School in Staten Island. It consistently ranks among the best schools in New York City in graduation rate, Regents test scores, and attendance. In 2012, SITHS was ranked #1 on the New York Post's list of the city's best high schools, #77 in the nation on U.S. News & World Report's list of Best High Schools, and #23 on their list of the nation's top schools in science, technology, engineering, and math (STEM). The State University of New York at Binghamton, commonly referred to as Binghamton University and SUNY Binghamton, is a public research university with campuses in Binghamton, Vestal, and Johnson City, New York, United States. It is one of the four university centers in the State University of New York (SUNY) system. As of Fall 2018, 17,768 undergraduate and graduate students attend the university. The Vestal campus is listed as a census-designated place, with a residential population of 6,177 as of the 2010 Census. Grey's Anatomy is an American medical drama television series that premiered on March 27, 2005, on the American Broadcasting Company (ABC) as a mid-season replacement. The fictional series focuses on the lives of surgical interns, residents, and attending physicians, as they develop into seasoned doctors while trying to maintain personal lives and relationships. The title is a play on Gray's Anatomy, a classic human anatomy textbook first published in 1858 in London and written by Henry Gray. Shonda Rhimes developed the pilot and continues to write for the series; she is also one of the executive producers, along with Betsy Beers, Mark Gordon, Krista Vernoff, Rob Corn, Mark Wilding, and Allan Heinberg. Although the series is set in Seattle, it is filmed primarily in Los Angeles, California. Original Signal Recordings is an American independent record label based in New York City. Original Signal is owned and operated by Music Nation, distributed by Universal Motown Republic Group, and is a member of the American Association of Independent Music. Original Signal was founded in 2007 by CEO Daniel Klaus and President Lucas Mann. Mann was named to Billboard magazine's fourth annual "30 Under 30" Power Players list. The Billboard charts tabulate the relative weekly popularity of songs and albums in the United States and elsewhere. The results are published in Billboard magazine. Billboard biz, the online extension of the Billboard charts, provides additional weekly charts. There are also Year End charts. The charts may be dedicated to specific genre such as R&B, country or rock, or they may cover all genres. The charts can be ranked according to sales, streams or airplay, and for main song charts such as the Hot 100 song chart, all three pools of data are used to compile the charts. For the Billboard 200 album chart, streams and track sales are included in addition to album sales. In 2008, Michaelson released her third album, and first compilation album, Be OK . The album debuted at #35 on the Billboard Charts and received mixed to positive reviews. The album features the single, "Be OK", which received a large amount of exposure on several shows and commercials. Michaelson joined the Hotel Cafe Tour that fall in support of the album, whose proceeds went toward cancer research. In 2009, Michaelson released her fourth album, Everybody . Everybody debuted on #18 on the Billboard charts and received positive reviews. It features the single "Maybe", which received positive reviews and was featured on several television programs. Her show in Sydney, Australia at the Metro Theater is available online at MoshCam, a website that shows pre-recorded concerts. "Be OK" is the first single from Ingrid Michaelson's third studio album, Be OK.
Everybody is the fourth album by Ingrid Michaelson. The album was released on August 25, 2009 on Cabin 24 Records. The first single from the album, "Maybe", was released on July 14, 2009. "Maybe" is the first single off Ingrid Michaelson's fourth studio album, Everybody. The song was featured on the ABC medical drama Body of Proof in the episode "Society Hill", the sixth episode of the first season. It was also used in Season 4 of the USA network show In Plain Sight in the episode "I'm a Liver, Not a Fighter," at the end of "The Glades" Season 3 Episode 2, and in a Hair Cuttery commercial. In 2010, Michaelson digitally released the single "Parachute," a song that she wrote but was used by Cheryl Cole on her album 3 Words . The song has not been featured on any albums, but is available on both iTunes and Amazon.com. In 2012, Michaelson released her fifth album, Human Again . Human Again debuted at #5 on the Billboard charts and received very positive reviews, with critics praising the album's unique sound. Michaelson's first tour leg for the album, The Human Again Tour, was sold out almost every night of the tour. Since the first tour, Michaelson has continued to tour on three other legs, two in North America, and one across the world. The first leg of Michaelson's tour was held from April to May. The second leg, The Human Again Summer Tour, was held from June to August. The Third Leg, The Human Again Fall Tour, began in September. Michaelson also played three shows in Australia, where Human Again was the first formally released record of hers there. 3 Words is the debut studio album by English singer Cheryl Cole released on 23 October 2009 by Fascination Records. Cole's first solo performance was on American rapper will.i.am's "Heartbreaker" (2008), on which she sang additional vocals. Following this it was announced that Cole's band Girls Aloud would take a break from releasing material who, at the time of the album's release, had enjoyed five successful albums and twenty consecutive top-ten singles. In April 2009, Cole started working on solo material in Los Angeles and London mainly collaborated with will.i.am, who served as executive producer of the album. On February 4, 2014, Michaelson released the lead single, "Girls Chase Boys", from her album Lights Out . The song reached number 52 on the Billboard Hot 100. "Afterlife" and "Time Machine" were released as the second and third singles with moderate commercial success. On April 25, 2014, Lights Out was released. The deluxe edition, which was released in November later that year, contains an additional 6 bonus tracks. On 12 May 2017, a 5 track EP titled Alter Egos was released. It consists of re-worked songs from It Doesn't Have To Make Sense with guest vocalists on each track. In 2006, Michaelson teamed up with William Fitzsimmons on his album Goodnight, which was released that same year. Michaelson provided back-up vocals on two songs from PlayRadioPlay! 's album Texas, including "I'm a Pirate, You're a Princess" and the title track, "Texas." Michaelson's band mate, Allie Moss released a 2009 EP entitled Passerby. A single from the EP, "Corner," was picked up in the United Kingdom by British Telecommunications for their BT Infinity television commercials. Other past and present band members include Chris Kuffner (bass), Bess Rogers (guitar), Saul Simon MacWilliams (keys), Billy Libby (guitar), Sarab Singh (drums) and Elliot Jacobson (drums). In 2010, Michaelson co-wrote a song entitled "Parachute" with Marshall Altman which was covered by British singer Cheryl Cole on her debut solo album 3 Words ; it peaked at number five on the UK Singles Chart in the United Kingdom. She initially felt the track was "so poppy" that she could not release it herself. However, after the song was reworked by "Everybody" producer Dan Romer to make a more "interesting, funky production," Michaelson released the song as a personal single. There are two different music videos for the song. In 2012, Michaelson and Laswell co-wrote and sang the duet "Landline," which appeared on his album of the same name. Her 2014 album, Lights Out, was very much a collaborative effort. "On all my previous records, I’d written all the songs myself. It was one producer and me locked in a room for months," she said. "Not that that was bad, but I think that everything has a season. I never wanted to kind of give up control. I think I’m letting go of a lot of things – embracing the idea of allowing people to help me in all facets of my life. I think that I was a bit of a control freak, and I’m just more open to letting people be part of things that they weren’t part of before. It’s really liberating. I had the best time ever on the last record. It was just really wonderful to be able to share the success with other people." She has also appeared on The Nerdist Podcast with Chris Hardwick. Meiko is an American singer/songwriter. She independently released a self-titled album on September 1, 2007. All of the tracks from the LP have been featured in major network TV shows. Her second full-length, titled The Bright Side, was released through Fantasy Records on May 15, 2012, and a single from the album, "Stuck On You", reached #1 on the combined Japanese AirPlay Chart and #1 on the International Chart in Japan. Sara Beth Bareilles is an American singer-songwriter, actress, and author. Greg Laswell is an American musician, recording engineer, and producer from San Diego, California. He attended high school at Valley Christian High School in Cerritos, California. He has released seven studio albums: Good Movie in 2003, Through Toledo in 2006, Three Flights from Alto Nido in 2008, Take a Bow in 2010, Landline in 2012, I Was Going to be an Astronaut in 2014, and Everyone Thinks I Dodged A Bullet in 2016, as well as several EPs and special singles. Many of his songs have been featured in films and television shows. "The Way I Am" is a song written by Ingrid Michaelson on her album Girls and Boys. One of the Boys is the second studio album by American singer Katy Perry. It was released on June 17, 2008 by Capitol Records. During its production, Perry was dropped from two record labels and went through two canceled albums. She collaborated with producers Greg Wells, Dr. Luke, David A. Stewart, and Max Martin, among others, on the album, and wrote all of its songs with assistance of other producers and writers. The EP Ur So Gay, containing the promotional single of the same name, was released to generate interest in the singer and the album. Jessica Rose James Decker is an American country pop singer-songwriter, reality television personality, fashion designer, and entrepreneur. At age 15, after auditioning for and being rejected by most of the country labels in Nashville, Tennessee, James began working on refining her craft with Carla Wallace of Big Yellow Dog Music. One of her songs attracted the attention of Mercury Records which offered her a recording contract. She released her debut album, Jessie James, in 2009. A few years later in 2013, she starred with her husband Eric Decker, a wide receiver in the National Football League, in the E! reality show Eric & Jessie: Game On, which stopped airing in April 2014, but returned in September 2017. On April 18, 2014, James released an EP through iTunes with 19 Recordings entitled Comin' Home. On her new label Epic, she released a five-track EP Gold on February 17, 2017, and released a surprise live EP on June 9, 2017 titled Blackbird Sessions. On October 13, 2017, she released her second full-length album and first for Epic Records, Southern Girl City Lights. On This Holiday, her first full-length Christmas album, was released on October 26, 2018. Decker will release next full-length studio album in mid-March 2019. Parachute is an American pop-rock band from Charlottesville, Virginia. Formed in 2006, they released their major-label debut album, Losing Sleep, in 2009, followed by their second album, The Way It Was, in 2011 and their third album, Overnight, in 2013. Vanguard Records released the band's fourth album, Wide Awake, on March 11, 2016. Elliot Benjamin Jacobson is an American drummer, songwriter and producer. He was the producer and cowriter of Vérité for her first EP, Echo and the majority of her second EP, Sentiment. He plays drums for the New York-based singer/songwriter Ingrid Michaelson. He also plays drums for Jenny Owen Youngs, Elle King, Emily Kinney, and Wakey! Wakey!. Human Again is the fifth studio album by Ingrid Michaelson. The album was released on January 24, 2012 on Cabin 24 Records and Mom + Pop Music. The first single from the album, "Ghost", was released on November 15, 2011. Secret Road Music Services is a boutique music licensing, music publishing, and artist management company in Los Angeles, California. The label's roster includes Ingrid Michaelson. Lights Out is the sixth studio album by Ingrid Michaelson, released on April 15, 2014 through Cabin 24 Records under exclusive license to Mom + Pop Music. It debuted at number 5 on the Billboard 200 chart, selling 37,000 copies in its first week. The lead single from the album, "Girls Chase Boys", was released on February 4, 2014. The second single from the album, "Afterlife", was released on October 2, 2014. The third single, "Time Machine", was released on February 19, 2015. "Girls Chase Boys" is the lead single from Ingrid Michaelson's sixth studio album, Lights Out. The song peaked at number 52 on the Billboard Hot 100. Siberia Acoustic is the first remix album recorded by Canadian electropop artist Lights, featuring acoustic reworkings of songs off her second studio album, Siberia (2011). It was released April 30, 2013 through Universal Music Group and Last Gang Records. The album was preceded on March 15 by the release of its first and only single, "Cactus in the Valley", which was re-recorded as a duet with American electronica project Owl City. The discography of American singer-songwriter Ingrid Michaelson consists of seven studio albums, eleven official singles and two other charted songs. Her two highest charting singles are "The Way I Am" and "Girls Chase Boys" at No. 37 and No. 52 on the Billboard Hot 100, respectively. It Doesn't Have to Make Sense is the seventh studio album by Ingrid Michaelson, released on August 26, 2016, through Cabin 24 Records under exclusive license to Mom + Pop Music. The album's lead single, "Hell No", was released on April 29, 2016. Songs for the Season, or Ingrid Michaelson's Songs for the Season, is the eighth studio album and the first Christmas album by Ingrid Michaelson, released on October 26, 2018. It takes a nostalgic approach to covers of Christmas standards and carols. ↑ Michaelson, Ingrid Ellen Egbert. "Songwriter/Composer: MICHAELSON INGRID ELLEN EGBERT". Broadcast Music, Inc. (BMI). Archived from the original on January 20, 2016. Retrieved May 5, 2015. ↑ Chretien, Joseph. "Michaelson in Fine Form on 'Human'". Times Record News . Archived from the original on 10 July 2017. Retrieved 10 July 2017. ↑ "Conversations: 'The Sweater Song' Singer Ingrid Michaelson". The Washington Post. August 30, 2009. Retrieved December 4, 2012. 1 2 Baby, Remember Her Name. Staten Island Advance AWE. (May 24, 2007). Retrieved on August 14, 2007. ↑ "Music Review: Ingrid Michaelson – Girls and Boys – Blogcritics Music". Blogcritics.org. 2007-10-25. Retrieved 2012-07-25. ↑ "INGRID MICHAELSON "Girls and Boys" Cabin 24". Washingtonpost.com. November 16, 2007. Retrieved 2012-07-25. ↑ Werde, Bill (Jan 12, 2008). "Ingrid Michaelson: The Way She is – the End of the Old Music Business? Or the Face of the New One?". Billboard: 24–26. ↑ "Ingrid Michaelson – Biography | Billboard". www.billboard.com. Retrieved 2016-03-30. ↑ "Half the Sky: Turning Oppression Into Opportunity for Women Worldwide". Halftheskymovement.org. 2012-08-30. Retrieved 2014-07-11. ↑ "Hell No: Ingrid Michaelson: Music". Amazon.com. ASIN B01EPN1TMK . Retrieved July 2, 2016. ↑ "Ingrid Michaelson: It Doesn't Have to Make Sense: Music". Amazon.com. ASIN B01HI9BW6Q . Retrieved July 2, 2016. ↑ "Ingrid Michaelson: Tour". IngridMichaelson.com. Retrieved July 2, 2016. ↑ "Irish Top 50 Singles". Irish Recorded Music Association. Archived from the original on December 17, 2011. Retrieved December 17, 2011. ↑ "Greg Laswell – Take A Bow". Archived from the original on February 15, 2010. Retrieved February 22, 2010. ↑ "Greg Laswell – Hello/ The Solo Residency / iPhone App/ Take A Bow". Greglaswell.tumblr.com. 2010-01-15. Retrieved 2012-02-10. ↑ Blauvelt, Christian (2010-10-18). "Ingrid Michaelson's 'Parachute'video: An EW exclusive premiere | The Music Mix | EW.com". Music-mix.ew.com. Retrieved 2012-02-10. ↑ Pound, Kara (February 6, 2015). "Ingrid Michaelson progresses from Indie sweetheart to bona-fide pop star". The St. Augustine Record. Retrieved March 1, 2015. ↑ "Ingrid Michaelson to Join B'way's 'Great Comet' + More Projects Announced". Backstage.com. Retrieved 2017-07-06. ↑ Fierberg, Ruthie (3 Jan 2019). Ingrid Michaelson Is Writing a Musical Adaptation of The Notebook. ↑ 'The Notebook' Heads to Broadway, With Songs by Ingrid Michaelson. ↑ "Ingrid Michaelson makes film debut in 'Humor Me' this weekend". Staten Island Entertainment. Retrieved February 27, 2018. ↑ Rodman, Sarah (May 31, 2014). "Friends help Ingrid Michaelson move ahead". The Boston Globe . Retrieved September 10, 2014. ↑ "Singer Ingrid Michaelson and husband Greg Laswell divorce". ↑ Tam, Ruth (February 8, 2014). "Ingrid Michaelson: 'I've never called myself a feminist, I just was one since birth.'". The Washington Post . Retrieved May 28, 2015. ↑ "Ingrid Michaelson Dating Will Chase Following Split: Photo". Us Weekly. 2015-07-07. Retrieved 2018-02-07. Wikimedia Commons has media related to Ingrid Michaelson .